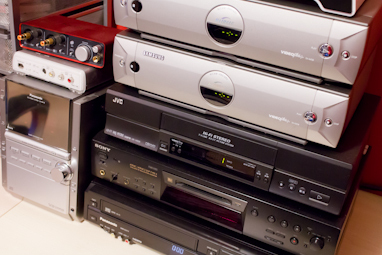 Video tapes can degrade in quality over time, and video players are becoming increasingly difficult to buy. We can convert your old video tapes to DVD, Blu-ray, USB or a digital video format, compatible with a wide range of devices including iPhone, iPad, Apple TV, Mac, PC, Android and many modern Smart TVs, so you can keep and enjoy your precious memories for years to come! Videos are transferred to our Mac editing workstation using professional capture equipment. We then apply any tweaks such as colour correction, trimming, audio adjustments etc, and we also remove any fuzzy edges, often associated with VHS tapes. DVDs are burnt to professional grade discs and inkjet printed with the tapes contents. Discs are normally supplied in a clam-shell style case, but full size DVD cases with custom inlay sleeves can also be ordered. Regrettably, we are unable to convert any type of cine film. We have a very simple pricing structure – we charge just £12.00 per tape you send us to be transferred to DVD. No additional postage fee and no hidden charges. Just post your tapes to us, include your return address and payment, and we’ll do the rest! It couldn’t be easier! Quantity discount available – please ask for an accurate quote. USB memory sticks can be supplied at cost, depending on how many videos you would like transferred, or you are welcome to supply your own. We can also supply a direct download link for your video for an even faster service. Should you need more copies of the transferred video on DVD, these are charged at just £3.00 each. For small orders, we can usually have the converted videos posted back to you in just a couple of days.